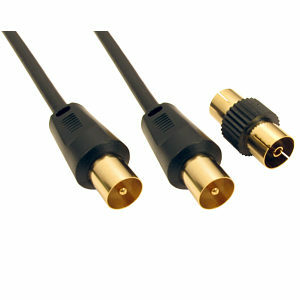 High quality 10m plug to plug TV Aerial Cable. SLx Gold 8 way TV Signal Booster / Aerial Amplifer with F type connectors 28105F. Flat gain response across full frequency spectrum ensures optimum digital reception. Fully compatible with Sky/Sky+ digieye/digilink remote control extender systems. Can be used to boost the signal from VCRs, DVDs and satellite receivers. DAB/FM tuner can be connected to any of the amplifier outputs. Features built in Tetra Filters, Surge Protection and Short Circuit Protection. Full VHF compatibility for TV and FM/DAB including Ireland. 8dB gain per port. Noise figure <4dB. Frequency Range VHF/FM/DAB47-230MHz UHF 470-862MHz. Designed to distribute Digital TV and Digital Radio signals to up to 6 TVs/DAB tuners. Dual RG6 Coaxial Cable Satellite Coax Cable 100m Drum / Reel - shotgun style. High quality dual RG6 coaxial cable satellite coaxial cable. Double screened, braid and foil screen. Foam filled. Supplied on 100m drum. Ideal for LNB connections on Sky, Sky Digital, Sky+, Sky HD, Freesat and other satellite receivers and cable TV systems. Colour black.